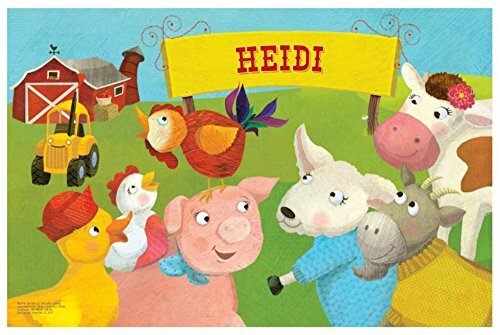 Discover life on the farm with this personalized puzzle, featuring your child's name and a variety of farm animals. Children can learn about the different types of animals living on a farm and how to spell their own names as they put the puzzle together. Our beautifully illustrated, high quality puzzles are a great way to develop cognitive skills, problem solving, fine motor skills, hand-eye coordination and self-esteem. Your child will delight in putting together the 24 pieces and seeing his or her very own name! Made with sturdy 100% recycled laminated cardboard. UNIQUELY PERSONALIZED NAME PUZZLE FOR KIDS - This puzzle is customized with your child's first name, and helps your child learn to spell his or her own name! LEARN ABOUT DIFFERENT FARM ANIMALS - Learn about the names and shapes of different farm animals as you put the pieces together! PERFECT FOR BIRTHDAYS, HOLIDAYS or EVERY DAY! - This personalized puzzle is a unique and engaging gift for creative minds. HIGH QUALITY - This 24-piece, 18 by 24-inch puzzle is made with 100% recycled laminated cardboard and is perfect for boys and girls ages 3-8. GUARANTEE - We stand by our personalized books and gifts with a 100% money-back guarantee.